One trouble with software and hardware reviews is that they are usually based on a few days of testing. If any long term problems exist, reviewers are unlikely to detect them. So, after six months of using my Keyboardio01 Model daily, I think it is time for an update, especially since a few issues have revealed themselves that potential buyers might want to know about. I wrote my initial review still in my first fit of excitement over my new keyboard. I had been waiting several years to receive it, and its aesthetics, ergonomics, construction, and customizability added up to a product far better than anything else on the market. Six months later, that opinion remains more or less intact. I’m using the Model 01 to type this review and my other keyboards are retired to the status of emergency backups. However, there are aspects about how Keyboardio is run and marketed, as well as a couple of minor hardware glitches that potential buyers should know about. Keyboardio is a small company. So far as I know, the company has two regular employees, the founders Jesse Vincent and Kaia Dekker. They take transparency seriously, and generally respond to email requests for help within a few hours. However, they also appear to be keeping so filling orders that the company is still making the transition from a startup to an active company. 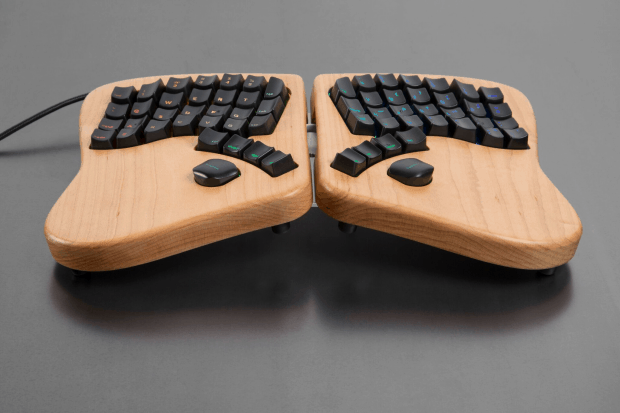 This situation is wonderful for Keyboardio; Vincent and Dekker have worked extremely hard, and deserve the success they seem to be having. However, for customers, the success is less than ideal. Orders may take several weeks or more to fulfill, and you can never be sure until you ask how long you can expect to wait. Although Keyboardio is open about delays, that is small compensation for customers who are accustomed to orders to be fulfilled immediately. More seriously, the production and quality control problems that the Keyboardio has documented on its blog for the last few years have not gone away. According to Keyboardio’s last blog in May, on a couple of occasions, manufacturers were reporting 30 and 50 percent failure rates for the keyboard’s enclosures due to humidity. The company seems to be doing its best to maintain quality control, but a few defective keyboards do seem to manage to slip through to customers, although, to Keyboardio’s credit, it seems to be conscientious about replacing any that are reported. Still, whether these problems are unusual in hardware manufacturing, or are simply emphasized by the company’s transparency is hard to know. Another problem is that extras have been discussed, but have yet to ship. These extras include a custom carrying case as well as sets of keycaps for alternative layouts. On the software side, Chrysalis, the graphical interface for customizing key layouts, has yet to appear eight months after the keyboards were released. According to a recent post on the Keyboardio forum, Chrysalis is currently being rewritten. For anyone with even basic programming skills, the lack of a graphical interface is hardly crippling, since editing the firmware is simple enough if your main interest is in key layouts and adding multiple layouts. However, the lack may come as a surprise to unsuspecting buyers. Admittedly, the delay is not entirely Keyboardio’s fault, since Chyrsalis is a volunteer project, yet its apparent lack of priority seems surprising. Also, it is inconvenient, because the information about manual programming is scattered in several links. As the Model 01 has reached users, a few minor hardware problems have also emerged. One of these is the tendency of the stands for the two halves of the keyboard to wobble. Sometimes, the wobble can be solved by adjusting the two stands together. 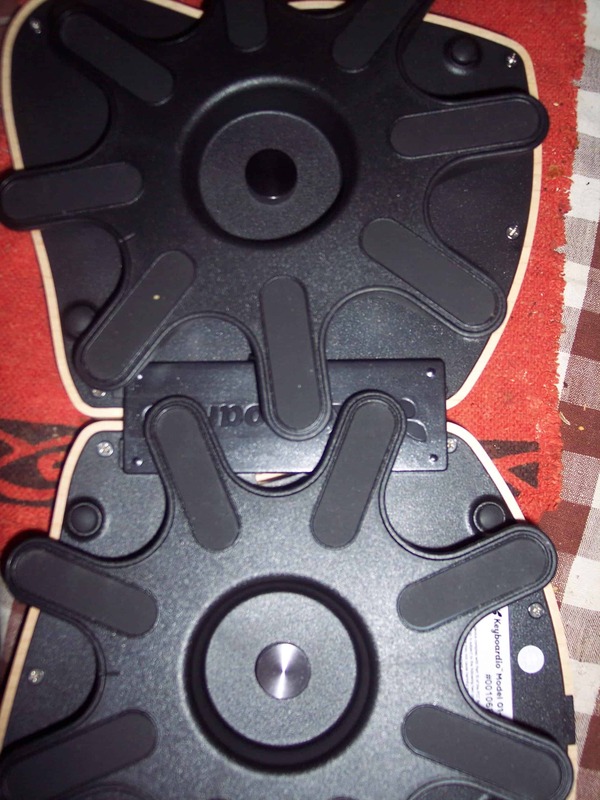 At other times, wobbles disappear when the screws that hold the stands in position are loosened. However, in some cases, the solution appears to be to slice into the rubber on the bottom of the stands so that a hidden screw can be loosened. This fix is unsightly, but hidden when the stands are in place. The repair job can also be cosmetically hidden with a small daub of rubber cement and painted over. The company will also replace defective stands, although there is no guarantee that the replacements will not have the same problem. However, by far the greatest hardware problem is stiff or chattering keys (keys that produce more than one character when pressed). Both problems occur only after weeks or months of use, and can sometimes make the keyboard unusable. They may be partially controllable by pressing only certain parts of the keycap, and sometimes can be fixed by holding the keyboard upside down and pressing the misbehaving key a few dozen times. More likely, stiff and chattering keys require that you disconnect the keyboard and remove the keycap on the misbehaving keys and clean the space beneath them, which can easily accumulate dust and small particles of food. Removing the keycap can take several tries, especially for those with short fingers, and requires a steady pull that is hard enough to lift the key, but not so hard that the mechanism breaks, which would require resoldering. Several keys may need to be removed in order to remove a key in the middle of the keybank. Once the keycap is removed, blowing compressed air or cleaning around the key mechanism with a fine paintbrush may be enough to remove the accumulated debris. If that fails, though, using an eye dropper to lubricate the key mechanism should solve both chattering and stiff keys. Once the key is working, you might want to clean out the keybanks using compressed air at least once a week, with or without removing the keycaps. So how do these shortcoming affect my opinion of the Model 01? Not much. Perhaps as an early backer, I have too much anticipation invested in my Model 01 after several years of waiting for delivery. Moreover, Keyboardio is so open about problems and discussing solutions that it is hard to be annoyed with a company that is so clearly trying its best to satisfy customers. Even more to the point, none of these problems seem overly important compared to the advantages offered by the Model 01. As I indicated in my original view, the Model 01 is a pleasure to see. It has all but eradicated my repetitive stress injuries, and can be customized for my needs and preferences. All these advantages are hard to top. Not does a little do it yourself repairs or maintenance seem unreasonable when working with an expensive piece of hardware. After all, you can hardly expect it to keep working indefinitely without some help. Still, potential buyers should know what to expect. I would still recommend the Keyboardio Model 01 but with a little more caution than originally. The fact that I consider Keyboardio an open hardware success story does not change the fact that new users should know what they are getting into — if only to avoid the disappointment of unrealistic expectations.